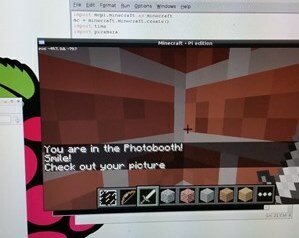 Before you get started you will be required to install the Python Pi-Camera Module and the Raspberry Pi Minecraft edition. Once the file has downloaded you will need to extract the file, this command will create a new directory in your home folder called mcpi, which is where the Minecraft installation files will be set up. Once your PiCamera is attached we need to create a function to capture the picture, this is very simple and can be achieved in a few lines of code. The picture can be previewed using the code, camera.start_preview(). To take the picture use the code camera.capture('selfie.jpg'). Where selfie is replaced with the name you wish to call the file, the filename. You will be required to run the Python code as a super user, so open the LX Terminal and type sudo IDLE, this opens Python, then create the the function below. Save the file into the pi.mcpi/api/python folder. Press F5 or run to test that the Pi Camera takes a picture. The next part of the program is to identify where exactly the player is within the Minecraft world. There are three coordinates X, Y and Z that can be used to reference the position of the player. Once we know the position of the player we can then compare that with the position of the Photo-booth, if they match then you are in the photo-booth. Remember this code needs to be run as a super user. 4. Are you in the Photo-Booth? 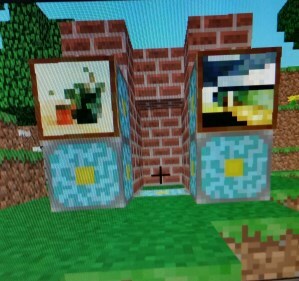 The final stage is to create the Photo-Booth and then run the code to compare the player's position and the position of the Photo-Booth, if they match that means that player is in the booth and therefor the Pi Camera will be triggered and a take a picture. A simple IF, ELIF statement makes this easy. In the example below the post to chat command is used to notify the player that they are in the booth. print "You are at the photobooth!" Now add the PiCamera code from step 2 into the if statement so that if the player's position matches the Photo-booth then take a picture. Remember that the program needs to be saved into the mcpi/api/python folder. Start a new MC game, when it is loaded then run the Python program. Locate your Photo-booth walk in and Smile! You could adapt the code so that it saves anew picture or takes only one picture and then pauses before taking another, even better see if your friends on multi-player can be papped!